Inspiration: Khazarian dictionary, a book by Serbian writter Milorad Pavić, written in such a way that it can be read and observed from many different angles and viewpoints. Also, Khazarians have a strange ability to wake up every day with a different appearance and sometimes even with a different gender. The title of the collection comes from the name of Khazarian princess, ATEH. She was a teacher, an adviser, a sorceress, a temptress, a protector of the cult of the dream-hunters. Her spirit is immortal, multifaceted and surreal. “Fashion Talent Design” competition at Serbia Fashion Week. In March 2017, Ivanović won the Fashion Scout SEE award at Belgrade Fashion Week, allowing her to present at London Fashion Week, as part of the Fashion Scout “Ones to Watch” segment. That same year she also participated in the menswear WoolMark prize competition in Milan, as well as presenting collections at Ljubljana Fashion Week and Fashionclash Festival in the Netherlands. She also won the “Belgrade Fashion Week Special Prize” at the October installment of Belgrade Fashion Week in 2017. 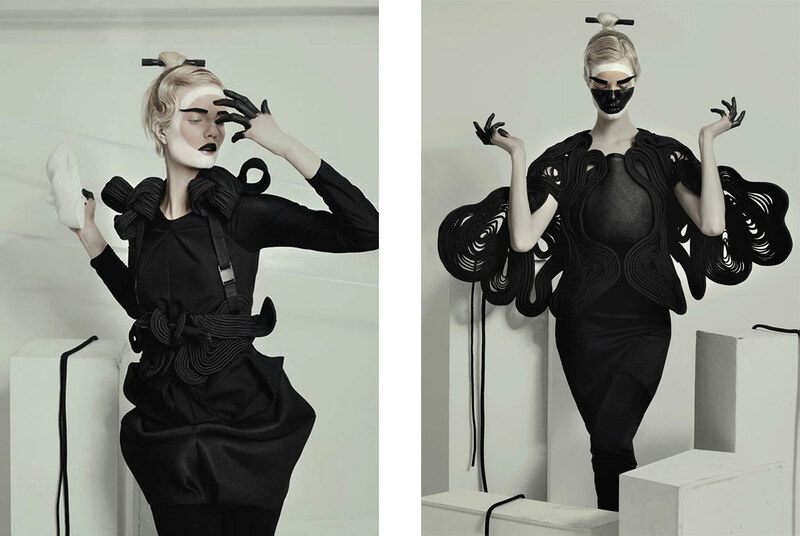 In addition to designing her collections, Ivanović works as a stylist, art director, and costume designer. In 2017, she styled an editorial piece for Serbia’s Wannabe Magazine and also designed costumes for singer Luke Black’s music video “Olive Tree”. The following year, Ivanović designed the costumes, done mostly in black and white, for musician Sanja Ilić and his band Balkanika, Serbia’s entry for the 2018 Eurovision song contest.